Have you ever looked closely - I mean CLOSELY - at a pair of Australian opal earrings? The most fascinating elements of nature seem to have been captured in the opulence of fine opal stones. They are a remarkable blend of fire, lightning, rainbows and the glorious shimmer of the ocean. When you wear Australian opal earrings, rings and or bracelets, all of these elements course through your veins, making you feel magical all over. Australia is the source of the finest opals in the world. More than 90% of all fine opals are found in the remote Australian outback. Tales and legends about these glorious little gems can be traced back to ancient times. Ancient Australian aborigines believed the opals were deposited in Australia when the creator came down to earth, riding on a rainbow, to bring a message of peace to all mankind. When his foot touched the ground, the stones came to life and began to sparkle with all of the colors of the rainbow. And that is how the opal was born. There are a vast number of gemstones in the opal group. They share one characteristic – continually changing colors that make them shimmer and sparkle like no other gemstone. This fantasy of color is described by experts as “opalising.” Opals are differentiated by type, place of origin and the color of the main body. Within these groups, the variations of opals are limitless. Each has its own special play of colors, making each fine opal totally unique. Opals that do not display this magical color play are “common opals” and not very valuable. The mystery of the fascinating color play was explained during the 1960s when a team of Australian scientists analyzed the composition of opals using an electron microscope. They discovered the opal was made up of silica gel spheres which caused light refraction and interference, creating the magnificent color play. The spheres manage to dissect the light as it passes through the gem and turns it into all the colors of the rainbow, continually changing. 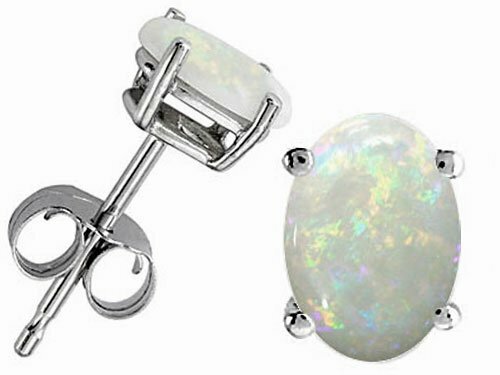 Australian opal earrings are not meant to be hidden away in a dark jewelry box. You should wear them and wear them often. Opals actually contain water. The amount of water varies, but the average fine opal is about 7% water. This means that if you hide it away, it could dry out and become brittle. 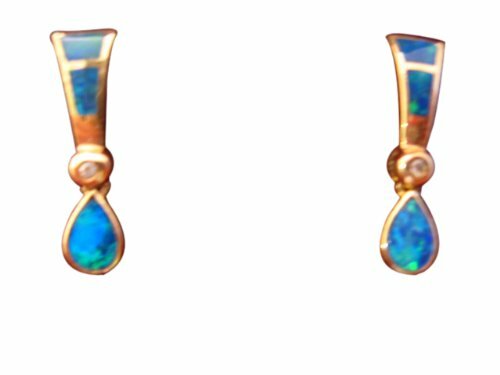 Over time your beautiful Australian opal earrings could show signs of fissures and the fabulous color play that make them so remarkable, will become dull or pale. When you wear your earrings, they get moisture from your skin and from the air around you. The color play and the pattern is the most important factor when determining the value of an opal. When you look at the stone and see the color red, then all of the other colors will appear, as well. Other considerations are the thickness of the layer, the beauty of the patterns, how it is cut, the weight and the finish. 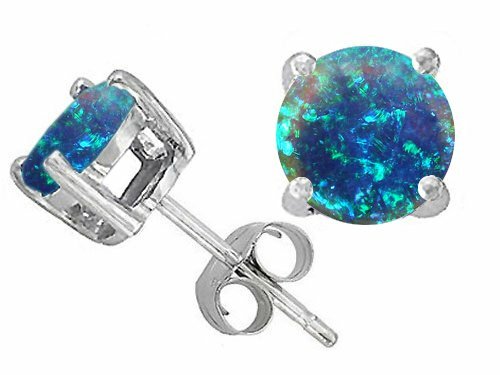 The overall impression of the opal, and of course, supply and demand also play a part in the final price you will pay for your Australian opal earrings. Knowing the different types of opals and how they are evaluated is very important so that you don't get misled and end up paying much more than the gem is worth. Of all Australian opals, the black are the rarest and therefore the most valuable. They are generally found as solid bars with the body varying in dark colors, like black, grey, brown or blue. Some have the complete spectrum of colors, while others have deep hues of blue. As with all precious gemstones, fake opals can be found just about anywhere. Always be careful of who you buy from. When in doubt, seek the help of an expert. 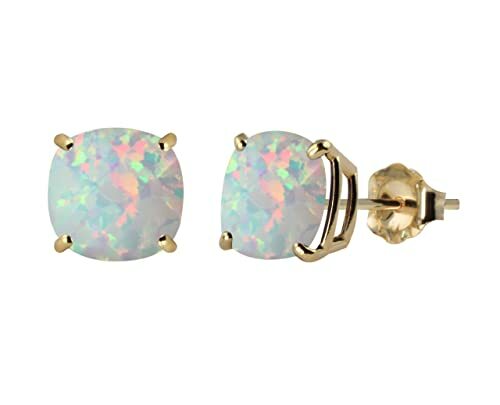 Because the fabulous color play, Australian opal earrings go with any outfit from casual to ultra chic. And remember, the more you wear your earrings the longer they will hold on to their brilliant shimmer and shine. Do you own an opal stone - either as an engagement ring, earring, or bracelets? What was your experience with this beautiful gem? Where would you recommend to buy opal for sale from? We would love to hear your thoughts and comments or perhaps request for help with opal stones. white opal on the Web page containing your story.